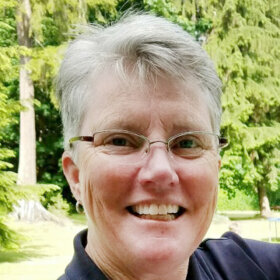 Cindi spent much of her 30 year career as a police officer on bicycle patrol. Recently retired from law enforcement, she thought her skills would carryover well as a bike tour guide. After she volunteered as a SAG driver for our Sierra Cascades cross-country tour, we couldn't have agreed more. She tells us that she can fix anything too - always a useful skill to have on tour! Cindi was absolutely fantastic. She looked out for all riders (the fast and the slow.) Always went out of her way to make things fun and to support us. She worked non-stop. Cindi is a super guide. She made the trip special with her concern for our safety, kindness, and great sense of humor. She was a big part of the success of my experience.